Intellectual axial low-noise and energy-saving fan for exhaust ventilation with air flow up to 370 m³/h. Maximum air flow combined with low noise level provide the ideal microclimate. Mounting into ventilation shafts or connection to Ø 100, 125, 150 mm. Specially designed impeller aerodynamic profile provides high air flow and low noise. 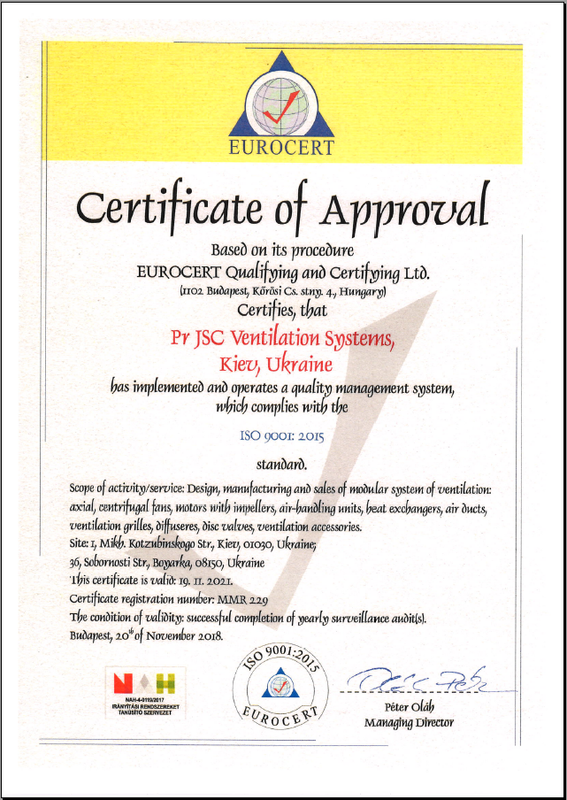 High ingress protection rating makes the fan the ideal solution for ventilation of a bathroom. The electronic components are protected with tight covers. The VENTS Quiet-Disc 150 and VENTS Quiet-Disc Extra 150 models are additionaly equipped with a special vibration absorbing sealer along the fan countour. Motor on special anti-vibration dampers for vibration absorption and silent operation. The VENTS Quiet-Disc 150 is supplied with a two-speed motor. The VENTS Quiet-Disc Extra 150 is supplied with a two-speed high powered motor. Operation modes of the fans models VENTS Quiet-Disc 150 and VENTS Quiet-Disc Extra 150 with modifications T, TH, VT, VTH, TP are selected by setting the DIP switch into the required position. The fan is turned off by default. The fan starts operating at the 1st speed when the switch isclosed and switches to the 2nd speed when the humidity sensor is activated. Manual control with a room light switch. The switch is not included in the delivery set. Speed control is possible through a thyristor speed controller or through a P2-1-300 speed switch (only for VENTS Quiet-Disc 150 models), see Electrical Accessories. Several fans may be connected to the same controller. Speed controllers can not be connected to the fans with the T, TH, TP, VT, VTH modifications. By the electronic control unit BU-1-60 (see Electrical Accessories). The control unit is supplied separately. By the timer T (the built-in turn-off delay timer enables the fan operation within 2 to 30 minutes after the fan switching off). Flexible air ducts may be used in case of remote location of the ventilation shaft. Connection of the air duct to the exhaust flange with a clamp. The EurAsian Conformity mark is a certification mark to indicate that the products conform to all technical regulations of the Eurasian Customs Union. Quiet-Disc T Turn-off delay timer modification with operating time from 2 to 30 min. Quiet-Disc TH Turn-off delay timer modification with operating time from 2 to 30 min and a humidity sensor with threshold from 60 to 90%. Quiet-Disc V Pull-cord switch modification. Quiet-Disc VT Modification with a pull-cord switch and a turn-off delay timer with operating time from 2 to 30 min. Quiet-Disc VTH Modification with a pull-cord switch, a turn-off delay timer with operating time from 2 to 30 min and a humidity sensor with threshold from 60 to 90%. Quiet-Disc TP Modification with a turn-off delay timer with operating time from 2 to 30 min and a motion sensor; reach distance up to 4 m, viewing angle up to 100°. Note: The VENTS Quiet-Disc 150 models with the T/TP/VT/VTH modifications are additionaly supplied with a turn-on delay timer adjustable from 0 up to 2 minutes.